Issue: Finding ways to improve outcomes and reduce spending for patients with complex and costly care needs requires an understanding of their unique needs and characteristics. Goal: Examine demographics and health care spending and use of services among adults with high needs, defined as people who have three or more chronic diseases and a functional limitation in their ability to care for themselves or perform routine daily tasks. Methods: Analysis of data from the 2009–2011 Medical Expenditure Panel Survey. Key findings: High-need adults differed notably from adults with multiple chronic diseases but no functional limitations. They had annual health care expenditures that were nearly three times higher—and which were more likely to remain high over two years of observation—and out-of-pocket expenses that were more than a third higher, despite their lower incomes. 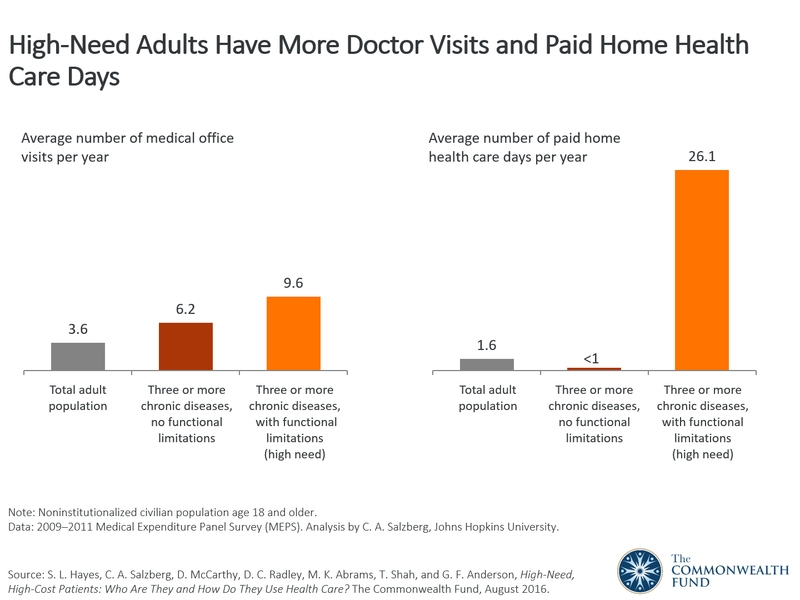 On average, rates of hospital use for high-need adults were more than twice those for adults with multiple chronic conditions only; high-need adults also visited the doctor more frequently and used more home health care. Conclusion: Wide variation in costs and use of services within the high-need group suggests that interventions should be targeted and tailored to those individuals most likely to benefit. Health systems, payers, and providers are increasingly focused on finding better ways to deliver care for high-cost patients—those who account for a high proportion of health care spending—as a strategy to improve patient outcomes and reduce health care spending.1 Yet targeting patients on the basis of cost alone, without considering their differing personal characteristics and needs, might not properly identify patients for whom an intervention would be most effective.2 Thus, we require a better understanding of the relationship between high needs and high spending. 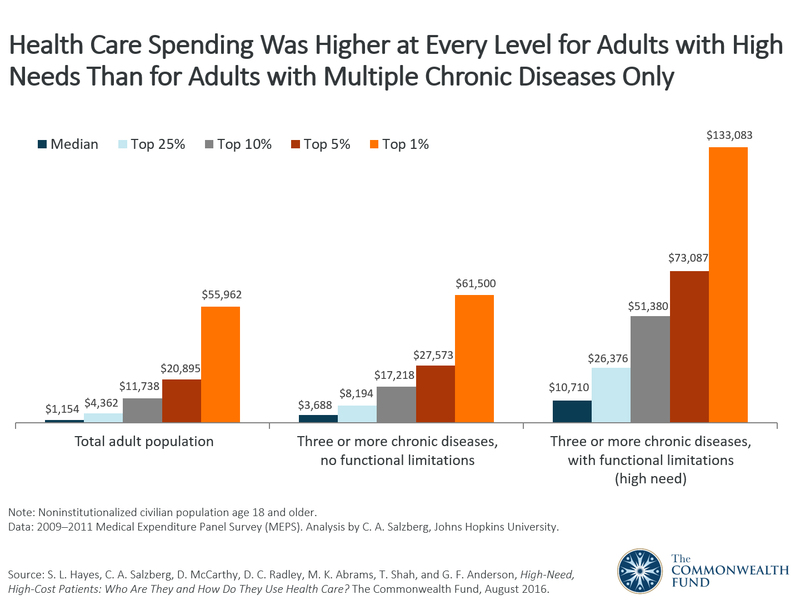 Patterns of health care utilization and spending for this group differed from those of other adults, including the 79 million adults with three or more chronic diseases but no functional limitations. The latter group serves as a useful comparison for our analysis because it allows us to gauge the additive burden of a functional limitation to multiple chronic conditions. We also make comparisons to the total population of adults living in the community. For high-need adults, average annual per-person spending on health care services and prescription medicines topped $21,000, nearly three times the average for adults with multiple chronic diseases only, and more than four times the average for all U.S. adults (Exhibit 1, Appendix Tables 1a, 1b).4 High-need adults spent more than twice as much, on average, on out-of-pocket expenses as adults in the total population ($1,669 vs. $702) (Exhibit 1, Appendix Table 7), while their annual median household income was less than half that of the overall adult population ($25,668 vs. $52,685) (Appendix Tables 1a, 1b). 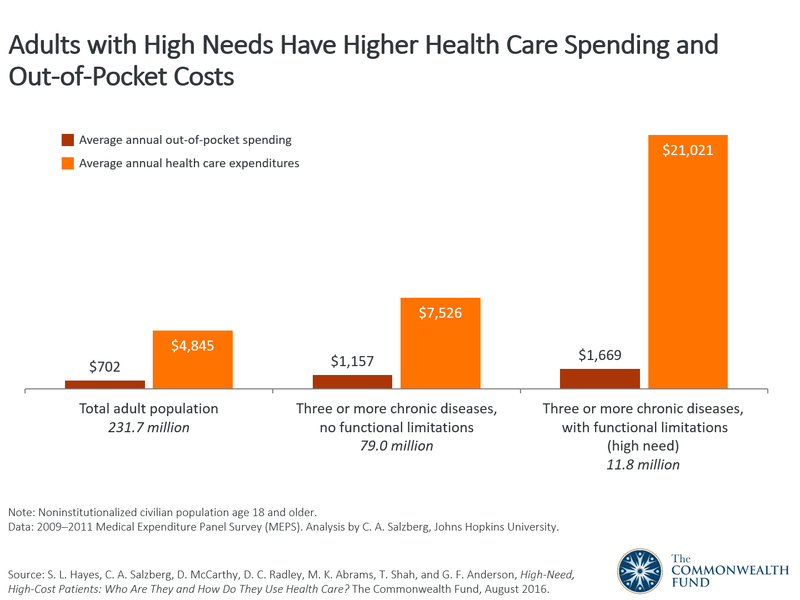 In contrast, average out-of-pocket spending for patients with multiple chronic diseases and no functional limitations was about a third less ($1,157) than that of high-need adults ($1,669); their annual median income was about the same as adults in the overall population ($52,499). Looking at the distribution of spending for high-cost patients (Exhibit 2), annual health care spending for the high-need adult population was substantially higher than for those with multiple chronic conditions only. For example, among those in each group who accounted for the top 5 percent of spending, annual spending was $73,087 for those with high-needs compared with $27,573 for those with multiple chronic conditions only. Older. More than half were age 65 and older; of these, most were 75 and older. In contrast, only about a third of adults with multiple chronic diseases, and less than a fifth of the adult population as a whole, were age 65 and older. Female. Nearly two-thirds of adults with high needs were women, compared to just over half of the total population. This may reflect the fact that the majority of high-need adults are older and that women tend to live longer than men. Less educated. More than one of four high-need adults did not finish high school, compared with one of seven of those with multiple chronic diseases and about one of six in the total adult population. Low income. More than half of adults with high needs had low incomes (i.e., below 200 percent of the federal poverty level, or less than $21,780 for an individual in 2011).6 This is nearly double the share in both the multiple chronic conditions–only group and the total adult population. Publicly insured. Nearly all adults with high needs had health insurance—only 4 percent were uninsured at the time of the survey, which was fielded before the Affordable Care Act’s major coverage expansions. More than four of five adults with high needs were covered by public insurance: Medicare, Medicaid, or a combination of the two, reflecting their older age and lower incomes. In contrast, only about two of five adults with multiple chronic conditions only, and even less in the total adult population, were covered by public insurance. Fair or poor self-reported health. The combination of a functional limitation and multiple chronic conditions appears to lead to worse self-reported health than multiple chronic conditions alone. While more than four of five adults with high needs (83%) reported fair or poor health, fewer than two of five adults (38%) in the multiple chronic diseases–only group did so (Appendix Table 6). As reflected in their greater level of health care spending, high-need adults use health care services at higher rates than do other adults. As a group, high-need adults used the hospital emergency department (ED) at more than twice the rate of adults with multiple chronic diseases only, and more than three times the rate of the total adult population. They were more than three times more likely to be hospitalized than adults in these other groups (Exhibit 4, Appendix Tables 2 and 3). People who are frequent hospital users are often the focus of programs that aim to reduce avoidable hospitalizations through improved care management.7 However, not all high-need adults were frequent utilizers. About two-thirds (65%) of high-need adults had no ED visits in a year, while about 3 percent, or 365,000 people, visited the ED four or more times during that time period. Similarly, a high share (68%) had no hospital discharges in a year, but 5 percent (579,000 people) were hospitalized at least three times in a year (Appendix Tables 8 and 9). ED visits were more common among high-need adults who were under age 65, living in poverty, lacking a high-school degree, and covered by Medicaid only (i.e., not dually eligible for Medicare) (Appendix Table 2). Hospital discharges, on the other hand, were somewhat more frequent among older than younger high-need adults, and among those with incomes above 200 percent of the federal poverty level as opposed to below (Appendix Table 3). 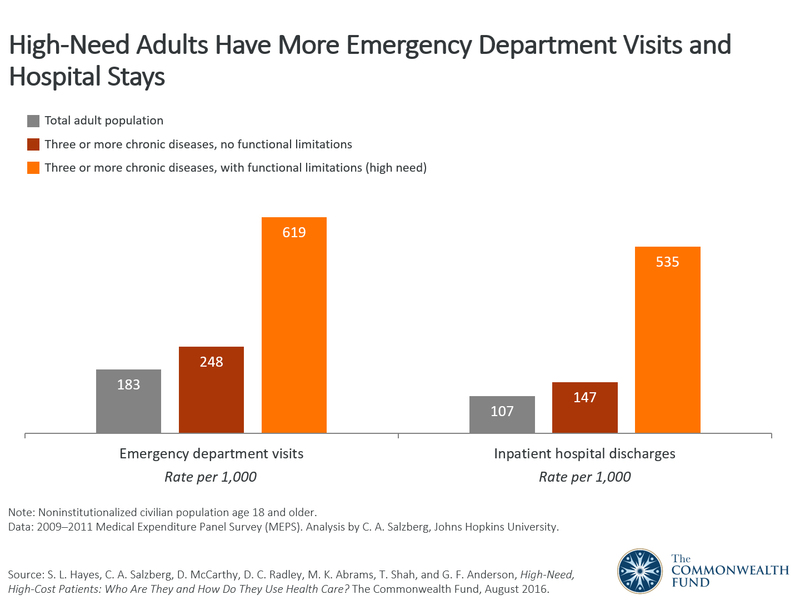 But as with ED visits, higher rates of hospital discharges also were observed among high-need adults with less education and among those who had Medicaid-only coverage. The high-need group exhibited variation in their use of services and in the demographics of those who utilized them. Only slightly more than a third (36%) made 10 or more visits to the doctor in a year, while a slightly greater share (43%) had five or fewer visits (Appendix Table 10). Patients with a higher average number of doctor’s visits were under age 65, had relatively high income, were college-educated, and were privately insured (Appendix Table 4). The opposite was true for paid home health care, with the highest use among the oldest (age 75 and older), the poorest, the least educated, and those dually eligible for Medicare and Medicaid (Appendix Table 5). Paid home health care was concentrated among a fraction of patients: 12 percent used more than 60 days compared to nearly three-quarters who used no paid home health care days at all (Appendix Table 11). We also looked at how “high-cost” individuals were distributed within the high-need and comparison groups. We defined individuals as having high health care costs if their total annual medical expenditures landed them among the top 10 percent or 5 percent of costliest patients in either one or both years they were observed in MEPS. We found that high-need adults were more likely to remain high spenders over two years than adults with multiple chronic conditions only or adults overall (Exhibit 6, Appendix Table 1a). In the high-need group, for example, nearly one of six adults was in the top 5 percent of spending for two years in a row, as compared to only one of 50 adults in the group with multiple chronic diseases only. Since care management is typically more cost-effective when targeted to those who persistently incur higher costs, focusing on the high-need group may offer a better yield in identifying patients for intervention. However, given that the multiple chronic diseases–only group includes millions more people, even the very small percentages of this group that are persistently high cost may also represent an important opportunity for improvement. We looked at how the total number of adults who incurred high health care spending for two years in a row were distributed based on their clinical complexity. 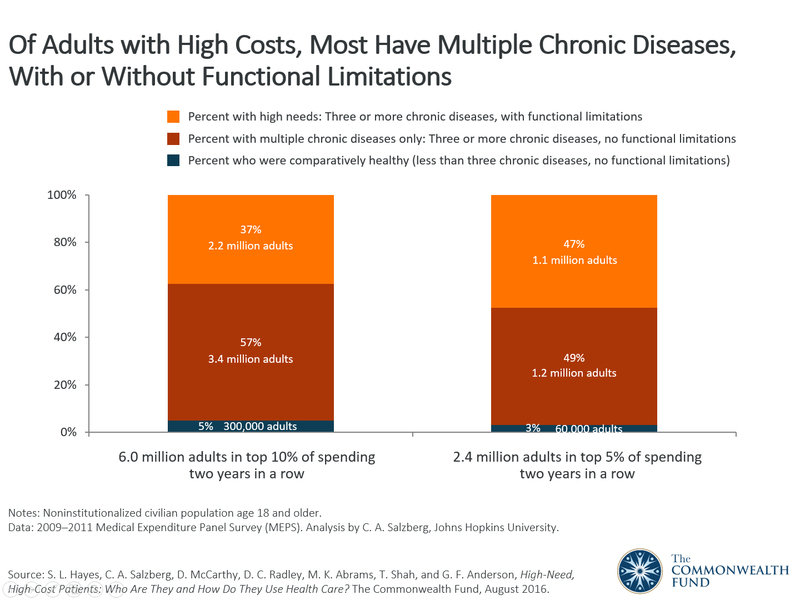 We found that nearly all high spenders have multiple chronic diseases, either with or without functional limitations (Exhibit 7, Appendix Table 1b). 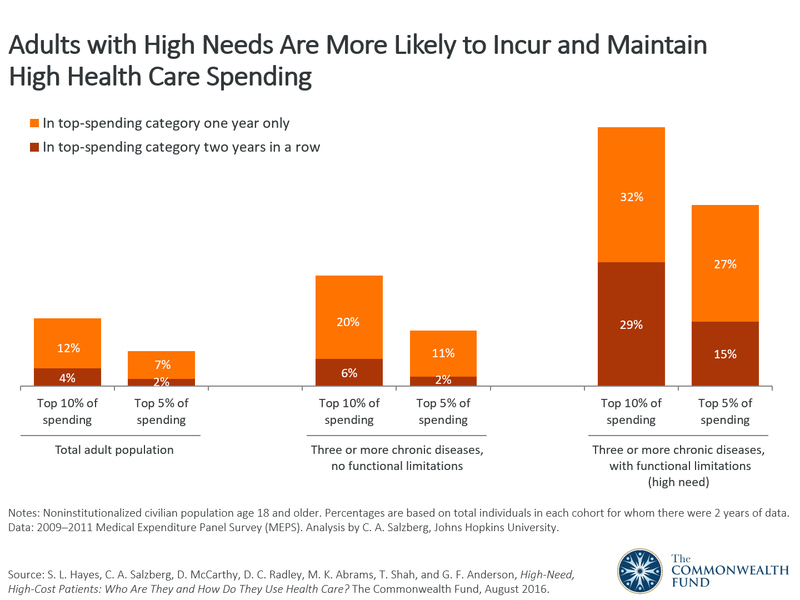 As the top spending category narrowed, however, to 5 percent from 10 percent, the share of people within it who had a functional limitation in addition to multiple chronic diseases—that is, the group we identified as high-need adults—grew: they represented a little over a third (37%) of those in the top 10 percent of health spending in both years but almost half (47%) of those in the top 5 percent of spending. Even among high-need patients, we found there is considerable variation in use and spending. This suggests the high-need population should be segmented into subgroups with common needs and health challenges. Payers and providers will need to take into account the persistence of high spending and patients’ amenability to change to better target and tailor interventions to meet particular needs and improve outcomes while achieving a return on their investment. We conducted a retrospective cohort analysis of the 2009–2011 Medical Expenditure Panel Survey (MEPS)–Household Component. MEPS is representative of the noninstitutionalized civilian U.S. population; we focused our analysis on adults age 18 and older. MEPS respondents were classified into four mutually exclusive cohorts. The cohorts were defined hierarchically, first among persons with and without functional limitation and then by the presence of fewer than three, or three or more, chronic diseases.11 Chronic diseases were identified using a previously described approach that assigns ICD-9 diagnosis codes (first three digits) to AHRQ’s Clinical Classification System.12 Functional status was based on respondents’ self-reported limitations in activities of daily living (basic personal care tasks) or instrumental activities of daily living (such as shopping, preparing food, managing medications, and performing routine household tasks). Reporting in this brief generally excludes the cohorts with fewer than three chronic diseases, with or without functional limitations, except to the extent they are reflected in the total adult population. 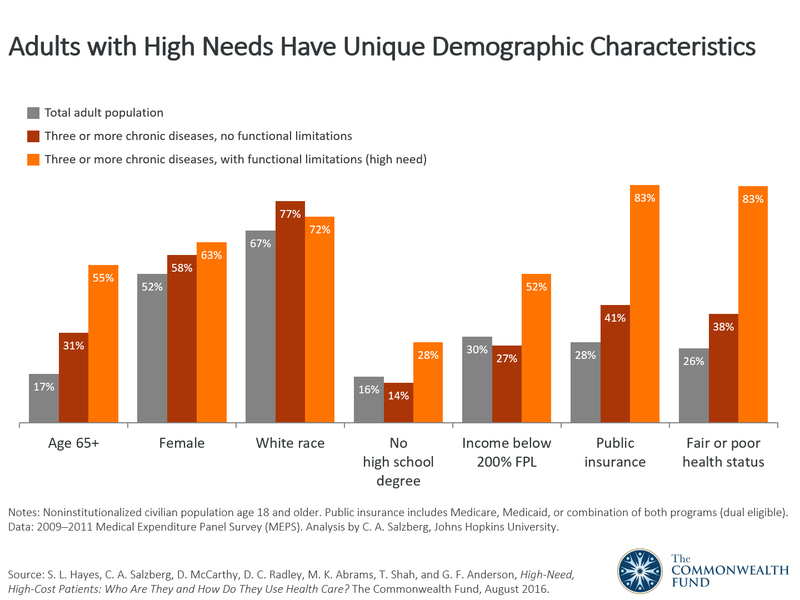 We defined adults with three or more chronic diseases and a functional limitation as “high need,” and compared this cohort to adults with three or more chronic diseases and no functional limitations and the total adult population on sociodemographic characteristics (e.g., age distribution, gender, race/ethnicity, educational attainment, income, insurance coverage status and type) and self-reported health status; health care utilization (e.g., number and frequency of visits to medical providers and hospital emergency departments, admissions to acute-care hospitals, days of paid home health care); and health care spending patterns. For the latter, we calculated per capita total health care spending estimates within each cohort. Health care spending includes expenditures for services provided by hospitals, physicians, and other health care providers, as well as for prescribed medicines, dental care, and medical equipment. Among those with two years of observation in our MEPS sample, we defined “high-cost” segments of individuals as those whose annual total health care spending was in the top 5 percent and 10 percent of spending for all adults in each or both of the two years observed in these data; we examined how these “high-cost” individuals were distributed within and across the analytic cohorts and total adult population. Limitations. Those who face financial or other barriers to care, or who are less likely to seek care when medically needed, may be underrepresented in counts of chronic diseases because they have not had the opportunity to be medically evaluated and diagnosed. All authors contributed to data interpretation. Data analysis was conducted by Claudia A. Salzberg under the supervision of Gerard F. Anderson at the Johns Hopkins Bloomberg School of Public Health under a grant from The Commonwealth Fund. This brief builds on a prior analysis by Eric T. Roberts also under a grant to the Johns Hopkins Bloomberg School of Public Health. 1 L. J. Conwell and J. W. Cohen, Characteristics of Persons with High Medical Expenditures in the U.S. Civilian Noninstitutionalized Population, 2002, MEPS Statistical Brief #73 (Agency for Healthcare Research and Quality, March 2005). 2 G. F. Anderson, J. Ballreich, S. Bleich et al., “Attributes Common to Programs That Successfully Treat High-Need, High-Cost Individuals,” American Journal of Managed Care, published online Nov. 10, 2015. 3 “Adult population living in the community” refers to the noninstitutionalized civilian adult population age 18 and older. 4 Average annual spending amounts calculated from MEPS differ from National Health Expenditure Accounts per-person medical expenditure estimates because they are based on household-level data and exclude spending such as health care for active military personnel, long-term institutional care, nonmedical assistance with activities of daily living, administrative costs, and disproportionate share payments to hospitals (DSH), among other items (see How This Study Was Conducted). For more information on the differences between the two sources of health care expenditure estimates, see D. Bernard, C. Cowan, T. Selden et al., “Reconciling Medical Expenditure Estimates from the MEPS and NHEA, 2007,” Medicare & Medicaid Research Review, 2012 2(4). 5 Racial and ethnic minorities may be underrepresented in counts of adults with multiple chronic conditions, both with and without functional limitations, if they face barriers to care that make them less likely to be diagnosed. Hispanics and Asian Americans have a longer life expectancy than white, non-Hispanics; therefore, their underrepresentation among adults with high needs is probably not an effect of the fact that they are younger, on average, than white Americans. See Kaiser Family Foundation, “State Health Facts: Life Expectancy by Birth (in years), by Race/Ethnicity” (Henry J. Kaiser Family Foundation, 2009). 6 In 2011, an annual income of $21,780 for one person was equivalent to 200 percent of the federal poverty level. In 2009 and 2010, it was $21,660. More information is available at https://aspe.hhs.gov/2011-poverty-guidelines-federal-register-notice; https://aspe.hhs.gov/2010-poverty-guidelines-federal-register-notice; and https://aspe.hhs.gov/2009-poverty-guidelines-federal-register-notice. 7 D. McCarthy, J. Ryan, and S. Klein, Models of Care for High-Need, High-Cost Patients: An Evidence Synthesis (The Commonwealth Fund, Oct. 2015). 8 A. S. O’Malley, A. Tynan, G. R. Cohen et al., Coordination of Care by Primary Care Practices: Strategies, Lessons, and Implications (Center for Studying Health System Change, April 2009). 9 Centers for Medicare and Medicaid Services, Medicare and Home Health Care (CMS, May 2010); and C. V. O’Shaughnessy, The Basics: National Spending for Long-Term Services and Supports (LTSS), 2012 (National Health Policy Forum, 2014). 10 The importance of functional limitations has also been emphasized in other research. See, for example, S. M. Koroukian, N. Schiltz, D. F. Warner et al., “Combinations of Chronic Conditions, Functional Limitations, and Geriatric Syndromes That Predict Health Outcomes,” Journal of General Internal Medicine, June 2016 31(6):630–37. 11 G. Anderson and J. R. Knickman, “Changing the Chronic Care System to Meet People’s Needs,” Health Affairs, Nov. 2001 20(6):146–60. 12 W. Hwang, W. Weller, H. Ireys et al., “Out-of-Pocket Medical Spending for Care of Chronic Conditions,” Health Affairs, Nov. 2001 20(6):267–78; and K. A. Paez, L. Zhao, and W. Hwang, “Rising Out-of-Pocket Spending for Chronic Conditions: A Ten-Year Trend,” Health Affairs, Jan./Feb. 2009 28(1):15–25. S. L. Hayes, C. A. Salzberg, D. McCarthy, D. C. Radley, M. K. Abrams, T. Shah, and G. F. Anderson, High-Need, High-Cost Patients: Who Are They and How Do They Use Health Care—A Population-Based Comparison of Demographics, Health Care Use, and Expenditures, The Commonwealth Fund, August 2016.